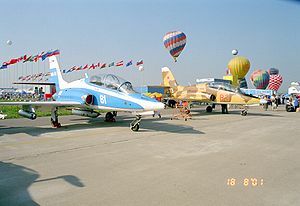 Picture - MiG-AT "81" and "83"
The Mikoyan MiG-AT is a Russian trainer aircraft that first flew in 1996, designed to replace Aero L-29 and L-39 for the Russian Air Force. The MiG-AT is more conventional than the competing Yak-130. It has a low-set, straight wing, engines mounted on either side of the fuselage and a mid-mounted tail. Two prototypes have been built. The first flight took place between March 16 and 22 1996 in Zhukovsky and lasted seven minutes.